Original 1835-1861 Bank Notes with Hand Written Signatures and Dates! Dateline Monday, March 4, 1861: The citizens of the United States had sworn in a new president from the state of Illinois named Abraham Lincoln, whose name did not even appear on the ballot in most Southern states. One of Lincoln’s campaign pledges was to keep slavery out of the territories. As a result, seven slave states in the South seceded and formed a new nation, the Confederate States of America. The incoming administration and most of the people of the Northern states refused to recognize the legitimacy of secession. On April 12, 1861 Confederate soldiers bombarded the Union soldiers at Fort Sumter, South Carolina. The Northern states rallied behind Lincoln's call on April 15, for all the states to send troops to recapture the forts and to put down the rebellion to preserve the Union and Civil War Broke out. This divide the U.S. not only territorially but ideologically. For four years Americans battled each other, sometimes brother against brother. The war finally came to an end April 9, 1865, when Robert E. Lee surrendered the last major Confederate army to Ulysses S. Grant. In the end over 620,000 soldiers died from combat, starvation, and disease. We have recently acquired a rare hoard of $5 and $10 Obsolete notes issued by the Bank of South Carolina between 1835-1861. This is very unusual, as the notes we typically destroyed upon closure of the issuing authority. 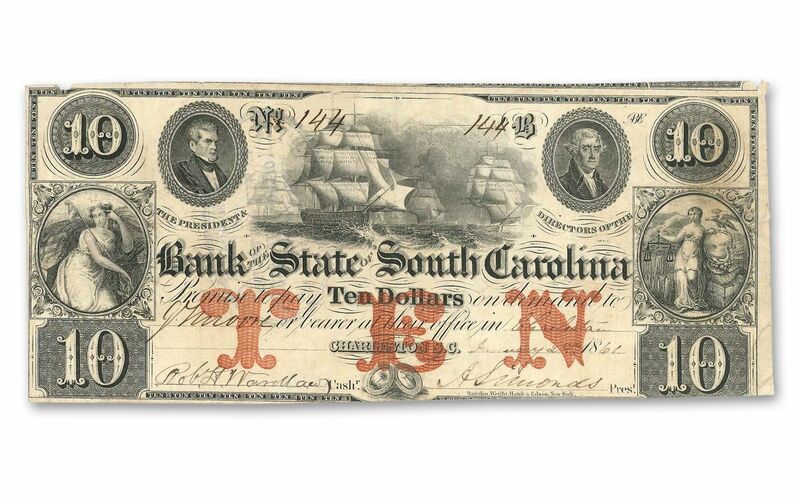 The survival of these notes is rare and now you can purchase this set of Civil War-era notes that may have been in the pockets of civilians during the outbreak of the Civil War in South Carolina. 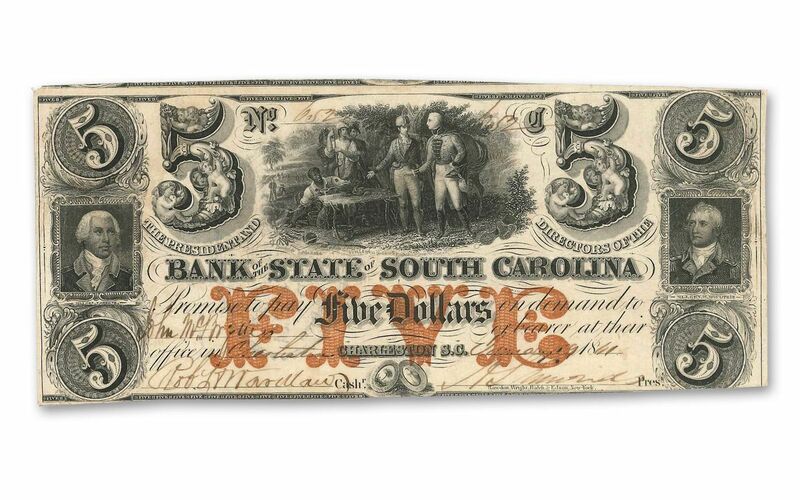 HISTORIC NOTES ISSUED BETWEEN 1835-1861-- Issued by the State Bank of South Carolina over 156 years ago! 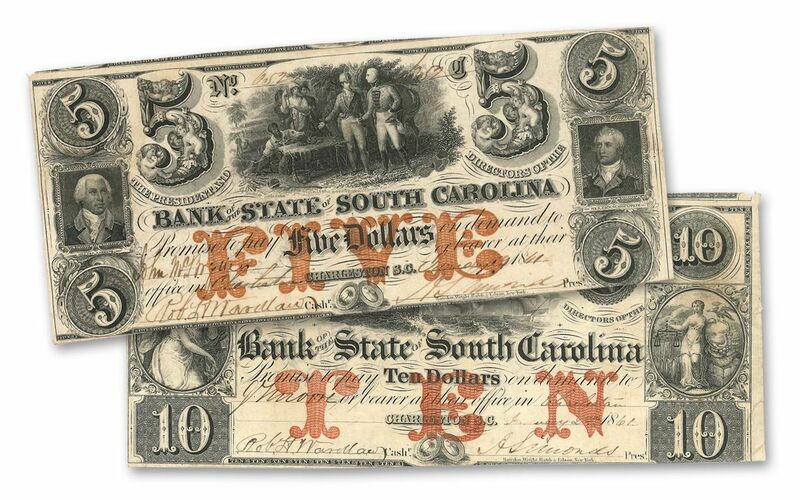 The Bank of South Carolina operated from 1812 through 1865 and served as the state treasury for South Carolina. PHYSICALLY SIGNED NOTES-- Each note features actual signatures, dates and serial numbers hand-written from back. SURVIVED AND ARE IN FINE TO VERY FINE CONDITION-- These notes, printed on large sheets, where then hastily cut apart by hand, leading many notes to have unique irregular cuts. The notes come to you in Fine (F) to Very Fine (VF) condition in a protective plastic sleeve and includes a Certificate of Authenticity. DESIGNS STRAIGHT OUT OF HISTORY-- The $5 note depicts a breakfast scene of sweet potatoes roasting in the fire, and shows General Marion, known as the “Swamp Fox,” inviting a British soldier to share breakfast. Around 1820, John Blake White created an oil painting of this event that now hangs in the United States Capitol. The $10 note features a detailed vignette of sailing vessels at sea along with allegorical maidens framed in circles. These maidens include Liberty on the left and a bare-breasted Justice on the right. These 1861 Bank State of South Carolina notes are a special find and would be a great addition to anyone's collection interested in American history. Imagine what it took to survive a civil war and now you can hold one these Civil War-era bank notes in your hand. What a great heirloom to pass down from generation to generation. Order now before we run out of these historic treasures.